Saturday, March. 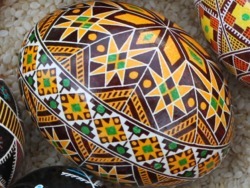 23, 2019 | 10:00 a.m. - 1:00 p.m.
Diane Rollins, who has been doing Pysanky style egg art since she was five, will teach you how to create your own stunning egg, as well as the history of this art form. The cost is $25 per person. Payment must be received when registering for the course. The fee includes all supplies and tools to take home. The class size is limited to 20 people. For ages 12 through adults. All registration slots for this program have been filled. Mon - Thu: 9 a.m. - 8 p.m. | Fri: 9 a.m. - 5 p.m.